Welcome To Olympic Peninsula Guide Service!!! Whether you've never held a rod or you're an avid angler, I'll guide you on your Private or group trip that will cause your heart to soar. If you're looking for that perfect gift for a loved one, or you're just tired of getting skunked, choose Olympic Peninsula Guide Service and I'll take you to where the surroundings are pristine, the air is clean, and your time is filled with awe and smiling wonders. Here at Olympic Peninsula Guide Service, we pride ourselves in being able to not only find those elusive fish, but get you fighting them. Tap on the button and let's talk! 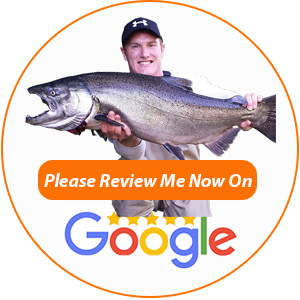 Tap here to leave me your own feedback!